Okay, since Matt left me in charge today and I'm away from my home and scanner and can't do any bonkers drawings he'd normally tell me to get out of his face, let's try something new: the Jalopnik What If Game. Here's how it works: I give you a hypothetical situation, and in the comments you tell me how you'd deal with that situation. Simple, right? You guys are a creative, fun, bunch, so I'm excited to see what you come up with. Today's situation is Fish Trailer. Specifically, that Polish fish trailer right there, from a picture sent to me by my friend Chris Boznos. 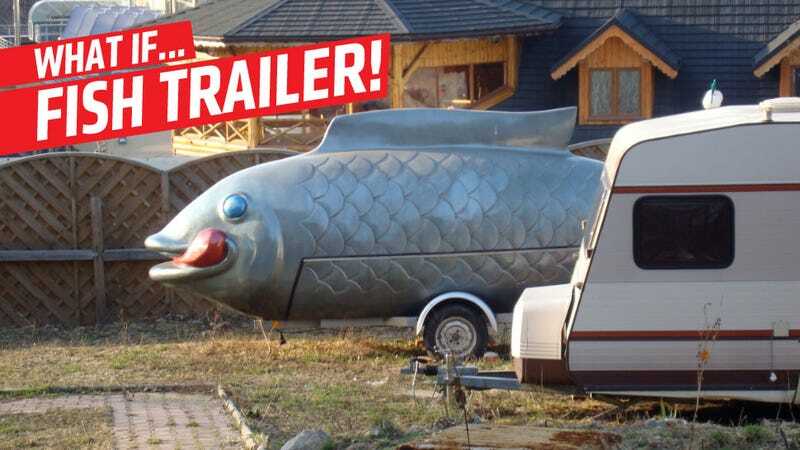 The situation is you were sent this Fish Trailer by your eccentric Polish Uncle, who demands that you put it to some sort of use or you're out of your massive inheritance. Did I mention he was rich? Oh, he is. How else could he afford a Fish Trailer like that? And have it hovercrafted all the way to your door? Okay, so now the ball's in your court: you have a beautiful Fish Trailer. How do you use it? Fishy food truck? Supercamper? Submarine conversion? A pair of LS1s at each rear wheel?